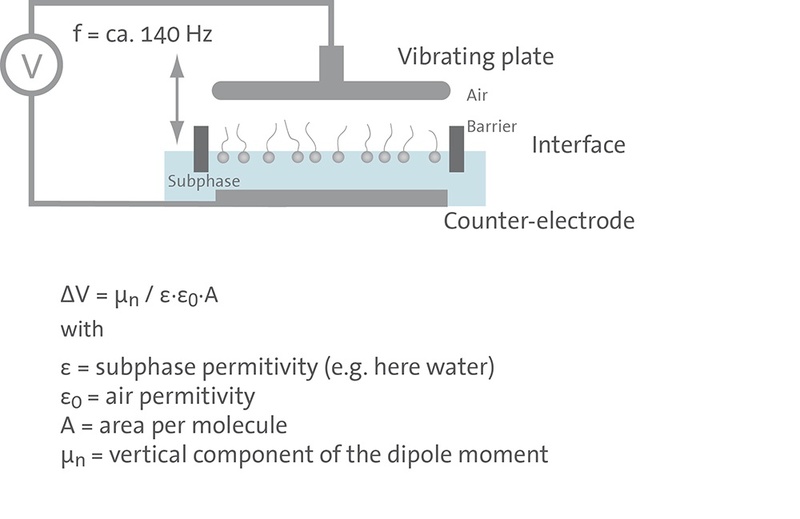 The Surface Potential Sensor (SPOT) measures the potential difference above and below the film and is sensitive to the sum of all the individual dipole moments rather than measuring surface pressure as a change in the surface tension of the air-water interface. Changes in surface pressure are only detected once a closely packed monolayer begins to form. However, changes in the surface potential can be measured as soon as dipolar molecules appear at the surface. As molecular orientation changes during compression, the alignment of the dipoles causes a large change in the surface potential. 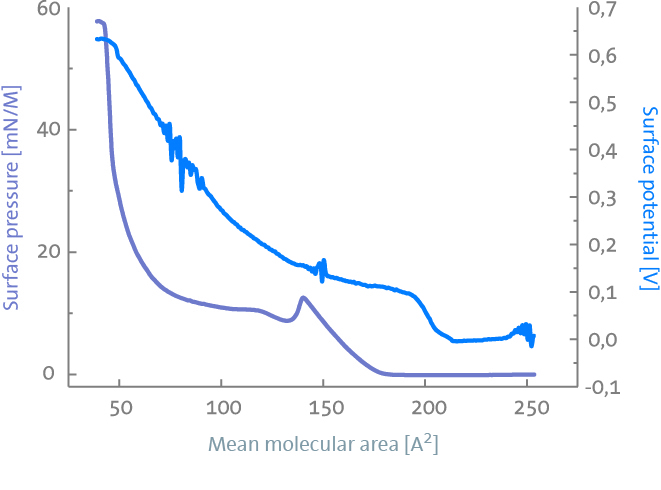 This is demonstrated in the plot below, which shows surface pressure-area (violet) and surface potential- area (light blue) isotherms of a monolayer of an antiparasitic drug on an air-buffer solution interface. An unusual surface pressure-area transition was observed at mean molecular area of 140 Å2, but no transition was observed in the surface potential-area isotherm. This suggests that the change was not a phase transition but instead that the drug could undergo aggregation, dimerization or conformational change at this mean molecular area. The KSV NIMA Surface Potential Sensor is a compact and highly sensitive characterization instrument.